Rugby’s hockey ladies are celebrating an incredible fourth consecutive promotion. After an extraordinary few years, the Rugby & East Warwickshire Hockey Club 1st XI have just secured a place in the Midlands Premier Division. Under the leadership of head coach Sue Sutton - who stood down from her role after the final game of the season - the ladies have undergone an astonishing transformation. They have risen from Warwickshire Division 1, through Midlands East and Midlands 2, culminating in the runners-up spot in Midlands Division 1 behind Loughborough Students. The ladies drew their last game with fellow promotion contenders Stourport 2-2 at Hart Field on Saturday, with goals from Lucy Gribben and Nicki Siarbawa. Their success has been recognised by again being shortlisted for Team of the Year in England Hockey’s annual awards. The winners will be announced at the presentation dinner in May. And three players have been selected for England squads: Goalkeeper Emma Olifent won silver with the Over 45s at the Masters World Cup in Spain last summer and Emma Allroggen and Kirby Harris have earned places with the Under 16s. Sue, a former team manager of both the Wales and Great Britain senior women’s squads, will maintain her involvement with REWHC. 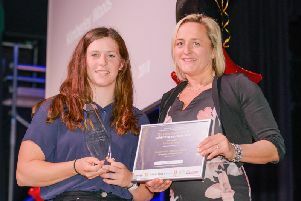 An experienced England Hockey Level 4 coach she will continue to develop the club’s talent. Her successor, Vince Mayne, has been assisting her for the latter part of the season. He is a highly experienced Level 3 coach, who has coached both men and women, with previous appointments at Newcastle and Coventry universities and at club level with Leamington HC. “Sue Sutton’s commitment and inspiration has encouraged players of all ages to train hard, believe in themselves and work together,” said team member Mary Shantikumar. “She and team captain Belinda Stephens have been an exceptional partnership. They’ve led the team to remarkable success: three league titles, an additional promotion, 76 wins, 13 draws and only 10 losses. “They’ve created a great team atmosphere for us, with a positive vibe and never any negativity. Club Chair Julia Bower added: “This is a phenomenal achievement for the club. Great coaching is at the root of this success but also the togetherness of the squad which has comprised players from 13 up to their mid 40s, who all want to work for each other to achieve success. “Plaudits need also to be applied to the club coaches who have developed many of the younger players since they have been at primary school and to the captains of the other ladies teams, who have all worked together to ensure that our first team can always have the squad numbers it needs, irrespective of availability throughout the section. She explained that in a day and age when funding for sports provision is often cut within the state sector REWHC feel an obligation to provide opportunities for young people to play hockey. The club runs seven men’s, four ladies and two badgers’ teams together with many age group squads. The U18 Girls play their Tier 2 England Hockey cup semi final on Sunday when the U16 boys are also in their Tier 2 regional finals. All boys’ and girls’ U10 and U12 squads have qualified as either winners or runners up of the Warwickshire Championships and are representing the County in the Midlands round within the next few weeks and finally the men’s over 40s will play in the national cup final at the Olympic park next month.